This will be the 27th year I have prepared the Christmas Eve Vigil. My husband experienced this Italian Feast every year of his upbringing – and I was fortunate enough to take part in this time-honored tradition with Cora for about ten years. But when we moved to Kansas in 1990, Cora passed the torch to me. It is a responsibility I do not take lightly – and I am honored to continue the tradition. My children grew up around the Christmas Eve table laden with a variety of fish dishes and Italian delicacies. Over time, we each have selected our favorites. My husband adores the Strufoli (Italian Honey Balls). My eldest looks forward to the Gingerbread House tradition. My son is a fan of the Christmas Day prime rib. And my youngest… she craves the Spinach Bread. The recipe is relatively simple and could easily be served year-round. But there is something about the deep green spinach with specks of red pimentos and swirls of snow-white bread that deem this an ultimate Christmas dish. 3. Drain spinach and squeeze dry. 4. Fill bottom of skillet with olive oil (about 1/4 cup). 5. When oil is hot, sauté garlic about 1-2 minutes. Don’t over cook. 6. Add spinach and sauté until dry – about 2-3 minutes. 7. Remove from heat and let cool. 8. Drain olives, slice, and set aside. 9. After dough has thawed… roll out to a rectangular shape. Dough will be thin. 10. 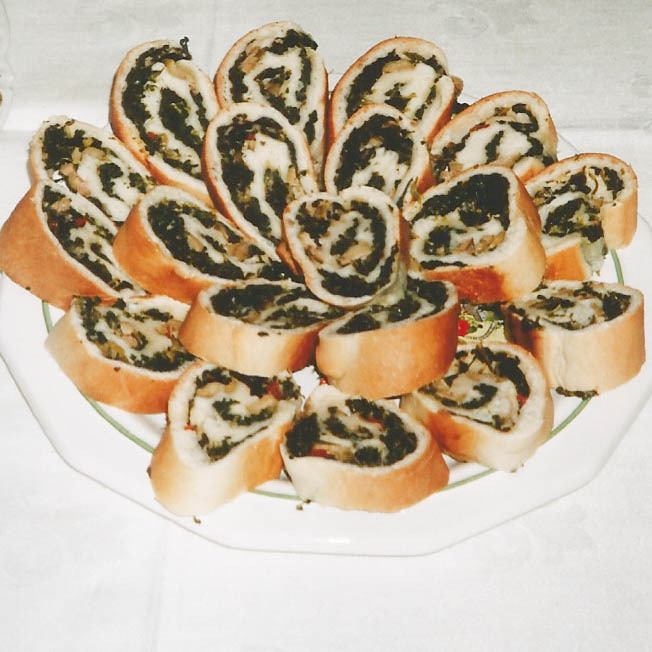 Spread spinach over dough – just to the edges. 11. Spread sliced olives over spinach filling. 12. Sprinkle grated parmesan over filling. 13. 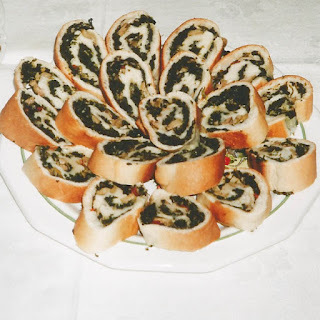 Begin to roll dough – jellyroll fashion. 14. Pinch top and ends so filling does not seep through. 15. Place rolled dough on cookie sheet – seam side down. 16. Cut three vent holes in top of dough (I use scissors). 17. Brush top of dough with an egg wash (egg yolk + a bit of water). 18. Bake at 350 degrees for approximately 25 minutes – until top is golden brown. 19. Remove from oven and let cool. The recipe is also featured in my newest book, Italian Family Christmas, available for purchase on Amazon. Ooooohhhhhh I MUST try this. I've never heard of spinach bread, but it's so pretty and I love all the ingredients. Maybe I'll make it for our Christmas Eve dinner. That's a beautiful loaf of bread! This looks good, sounds good, and has to be good. 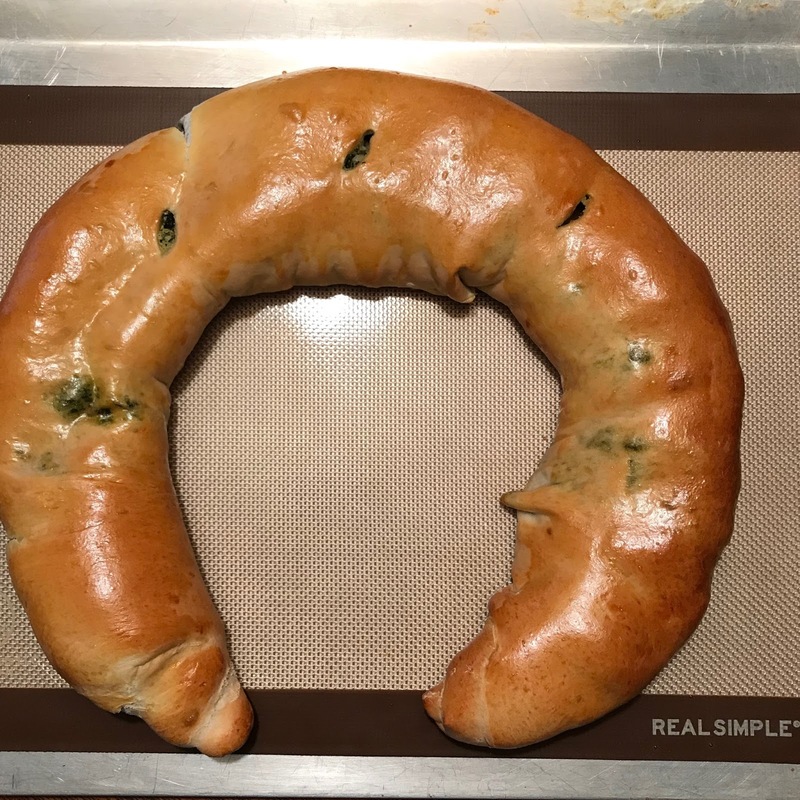 Spinach bread is a new one on me. I must give this a try. I, too, come from Italian roots, but I wasn't exposed to a lot of these while growing up. I want to seek them out, if I can, before we head to Italy in May of 2018.